Can Someone Please Help me with this Letter? We regret to inform you that, despite our previous assurances to the contrary, we will not be able to return your brain. Unfortunately, your brain was part of a shipment of brains that was lost at sea over the Bermuda Triangle, a region of the northwestern Atlantic Ocean in which a number of aircraft and surface vessels have disappeared in what are said to be circumstances that fall beyond the boundaries of human error or acts of nature. As you may know, some of these disappearances have been attributed to the paranormal, a suspension of the laws of physics, or activity by extraterrestrial beings. Although substantial documentation exists showing numerous incidents to have been inaccurately reported or embellished by later authors, there is no doubt that many ships and airplanes have been lost in the area. As is often the case in the place just described, the plane carrying your brain simply disappeared off any radar. Despite extensive searches and radio calls, we have been unable to make contact with the aircraft, its crew, or the items on board. In fact, one search plane was also lost in the process. We sincerely apologize for this egregious error. We realize now that in attempting to save time by crossing this area of the Atlantic Ocean in order to decrease costs and thereby increase profits, we have created a huge liability for ourselves. Our only hope is that because it was your brain that was lost, you will now lack the intelligence to realize the error was ours (despite this letter) and do nothing against us in retaliation or to mitigate your loss. We also offer our condolences; a deficit of this magnitude must be quite distressing. We certainly understand how you must be feeling right now, even without your limbic system. There must be some awareness on your part that something is, well, missing. As evidence of our sincerest and deepest sympathy, we would like to offer you this $10 gift certificate to Amazon.com. It is our hope that you will be able to locate a nice children’s book or some other fine gift befitting the current state of your intelligence. Perhaps a book on the alphabet or counting will allow you to find work at a telephone control center or at customer service for a credit card company. In fact, we would be willing to put you in touch with our affiliates in these areas should you require assistance in becoming gainfully employed. Additionally, we would also like to provide you with this gift of a handsome wallet for your identification and in some cases, pizza. Again, please accept our apologies. And have a happy holiday. Thank you so much. I so much appreciated your letter. Your kindness in letting me know that my brain had been lost in the Bermuda Triangle, and then your further kindness in offering me the $10 gift certificate and possible assistance with employment were both truly above and beyond the call of duty. I accept the Amazon certificate, by the way, and look forward to locating a book I can now read (as reading has become somewhat difficult in the weeks since losing my brain). I would like to take this opportunity to thank those who have been helping me in all areas, including reading, feeding, and wiping drool from my chin. Without you I may actually have drowned. Much gratitude also to my cousin for typing this letter on my behalf. I would beg your further kindness, if at all possible. Unfortunately, Amazon does not carry drool rags. I searched their site high and low (again with the assistance of friends and family) and was unable to locate one in my price range. I did locate a towel designed by a famous designer (his name escapes me at the moment–a not uncommon occurrence these days), only this towel was both quite large and quite expensive. It was not really suitable for my needs. I would prefer something absorbent that will withstand frequent washings. Actually, two or three would be most suitable so I have something to use whilst my soiled rags are being laundered. I also would like to inquire whether you are aware if others who lost their brains in this unfortunate incident might like to get together, not for a support group, but to play. I think it would be quite enjoyable to build things with blocks or stack plastic rings with one another. Our caretakers may even be able to trade ideas on dealing with the excess drool and, um, issues surrounding personal hygiene. I have been made to understand that diaper changing on adults is rather difficult, as you may imagine. Again, I so appreciate your thoughtfulness and hope this letter finds you well. I look forward to hearing from you soon. I baked cookies for Christmas. Yummy, buttery, sugar filled, high fat content cookies. Basically they were mostly butter, sugar, and flour, and the frosting was straight up butter cream. Yum, yum, yum, but oh, so rich. I could only eat one at a time or I would feel sick. I gave a bunch of these cookies as gifts to family and friends, but we still had a lot ourselves. I realized shortly after Christmas that I was going to have to give some more away; they were too rich for just me and Isabel to eat, and Milla was in Arizona for another five days. I decided I would take some to some friends at the coffee shop under my office. They were in the cupboard in a bag on top of our dinner plates. I thought of making the gift, but then forgot to take the bag to work with me. A few days later I was at home putting away the Christmas tree and decorations and remembered the cookies. Ahh, what a perfect way to ring out the holiday season but with a buttery cookie and a cup of tea? I put on the kettle to heat and opened the cupboard to get a cookie for Isabel and myself, and shock of shocks, the bag was gone! It wasn’t there! I peeked further into the cupboard to see if I was wrong. NO cookies. I looked in all the cupboards. I looked in the drawers. I looked in all of them again, and again. No cookies! I couldn’t figure it. What in the world had happened to them? I wracked my brains, trying to imagine if I had given them away and forgot about it. No. I did not. I could not fathom what in the world had happened to them. I asked Isabel. She was as baffled as I was and looked a little afraid I might not believe her. I gave her a hug and assured her that I knew she had not eaten that bag of cookies. There were a dozen and a half at least. It wouldn’t be possible for her to have, even if she could have gotten up in the cupboard and gotten them down. There weren’t any crumbs anywhere. Plus she’s not the sort to sneak cookies. If she wanted one, she would have asked first and then eaten it right in front of me. I started to worry. Someone, somehow had come into our house and eaten our cookies. I started to wonder about anything else a thief would want. The bluetooth speaker was playing music in the living room so it wasn’t stolen and neither was the computer playing the music. My camera was in my room. We don’t own much else of value that is the sort of thing a robber would want to steal. I couldn’t imagine anyone would come into our house and steal a bag of cookies and just take that. I was completely baffled, and honestly a little afraid. What in the world had happened to those cookies? Over the next several days I mulled this over and over. Isabel and I considered all the possibilities, but none were plausible. No one has a key to my house. I have a key hidden outside, and I moved it, just in case someone had found it and stolen the cookies, then returned the key to its hiding place just to trip me out. I don’t really have any trickster friends, but this was weird and I had to consider all options. I considered filing a police report, but just couldn’t bring myself to do so. It would seem much too ridiculous and I thought maybe they would wonder about my sanity. On Saturday I went to visit my best friend Debbie in Corvallis and told her the story. She too was completely baffled and afraid for me. None of it made any sense. Somehow those cookies were gone and I could not explain their loss. Today I cleaned house a bit. My dogs had chewed up a pinecone in my room and left little pieces lying everywhere. I dragged the vacuum from its place in the closet and plugged it in. I vacuumed through the main part of the house, the kitchen, the hallway, and my youngest daughter’s room (I don’t go into the teenager’s room–it’s scary in there). Then I headed into my room. Click, click, click, the vacuum sucked up pieces of pinecone. I began vacuuming under the bed. George, my Dachshund, loves dragging his forbidden quarry under the bed. He is constantly grabbing things that aren’t his and heading into his cave. It’s the perfect size for him. My vacuum is a canister vac, the kind with a head that has it’s own engine apparatus. It almost vacuums itself. As I vacuumed under the bed, I heard a strange flapping sound as the vacuum sucked something funny. I turned off the vacuum and leaned over, peering under the bed. What was that weird thing off toward the wall? I sat up and grabbed my iPhone, scrolled to the flashlight app, and shined it into George’s lair. There, far under the bed, was what appeared to be the chewed remains of the cookie bag. I called Isabel into the bedroom to have her crawl under the bed and grab the bag. She came immediately as she had been as curious as I in the disappearance of our sweets. I held the iPhone flashlight as she slithered under the bed with ease, retrieving the bag within seconds. 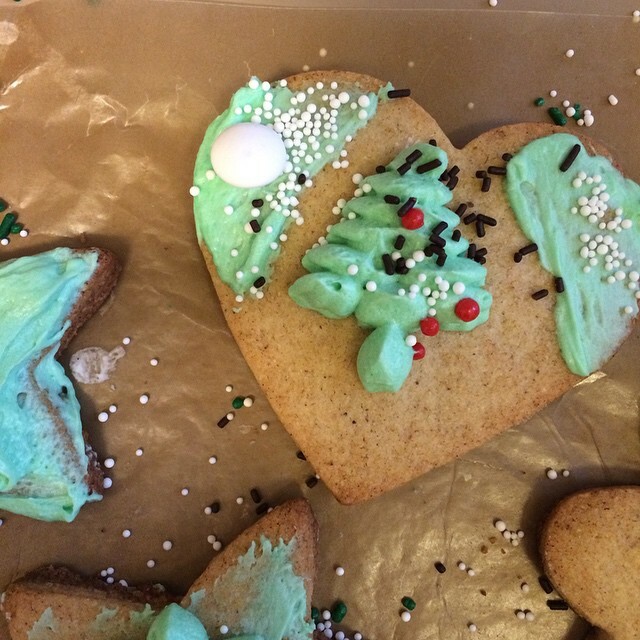 It was obviously the cookie bag–there were bits of green frosting remains in the crevices. The mystery was solved. I realized after this that in considering taking the cookies to my office, I must have removed them from the cupboard, set them on the counter, and then gotten distracted and left them there for the canine thief to steal. He’s done it before, jumped up and taken things off the counter. He might be short, but those squat legs of his are powerful and he can easily jump almost 4 feet in the air. All food goods must be pushed back from the counter’s edge if I’m not in the kitchen to supervise and intervene when George is around. I am relieved. I’m glad to know that no one broke into my house and stole our cookies. It also explains the obnoxious gas both dogs suffered with for two days, naughty things. In the future I’ll be more mindful, and if and when there is a time in the future when any food goes missing, the obvious place I’ll check for evidence will be under my bed. I often think of new little products, waiting patiently in their boxes to be used. They’re so new and orderly. Pick me! Their calmness and order seems to say as they lie there, waiting to be chosen. They have been waiting their entire lives for use, and here you are, choosing. Will it be me? Their orderliness seems to ask. Sometimes when I open a box of something, like Q-tips, and one of them pops out, I wonder if the other Q-tips were being mean to it or something, and it just couldn’t wait to escape. I’ll pour some vitamins in my hand, and one leaps out onto the floor, away from the other vitamins. Or other times it’s the opposite. I try and try to get something out of the box and it won’t come out, like it’s hiding in there, as if it knows that this will be the end in some way.